The purpose of this study was to promote the awareness of the earthbag building system, while calling attention to its sustainable properties. Although the earthbag building system allows for the construction of affordable and sustainable housing, it is not widely known and its sustainable characteristics have, therefore, gone unrecognized throughout the home building industry. A case study was conducted for this research. A private earthbag residence located in Crestone, Colorado, was selected based upon the builder’s experience and expertise in the earthbag building system. Interviews were conducted to acquire insight into the construction methods and materials used for the earthbag building system. Sustainable characteristics were assessed using criteria set forth by the U.S. Green Building Council’s (USGBC) Leadership in Energy and Environmental Design (LEED) Home program that intends to transform traditional home building practices into those that are more sustainable. By studying an existing earthbag residence in conjunction with the USGBC LEED Home program, it was possible to promote the awareness of the sustainable properties of the earthbag building system. This knowledge has implications throughout the housing industry, allowing for the construction of affordable and sustainable homes. Sustainable design has been a growing concern in the building industry. The term sustainable development has been defined as “development that meets the needs of the present without compromising the ability of future generations to meet their own needs” (World Commission on Environment and Development, 1987, p. 43). Originating in the 1970s and 1980s, sustainable design for the built environment emerged as a response to the over-specification of commercial buildings throughout the 1950s and 1960s (Guy, 1998). During the 1950s and 1960s, the social, economic, and environmental consequences of commercial development were given minimal consideration. However, the impacts of over-specification, such as poor indoor air quality, sick building syndrome, high employee absenteeism and turnover, acid rain, and high toxic particulate concentration in the air, were demanding attention (Kibert, 2005; Kwong, 2004). As a result, social scientists and environmentalists throughout the world began to create guidelines for alternative expansion of the built environment. This movement became known as sustainable development. While originally devised for the commercial building industry, sustainable design has transcended into the home building industry, carrying broad implications for the health and well-being of homeowners, neighborhoods, societies, and the environment. Benefits from this transition include a decrease in respiratory illnesses such as asthma, overall improved health due to higher indoor environmental quality, increased green space available for community activities, and a healthier environment (Kwong, 2004; U.S. Green Building Council, 2005). While the principles and guidelines of sustainable design may be used in conjunction with traditional types of home construction, the use of natural types of home construction would be even more beneficial. In this study, one natural type of construction, earthbag building, was evaluated in order to determine its sustainable properties. The purpose of this study was to promote awareness of the earthbag building system, while calling attention to its sustainable properties. Refined by architect Nadar Khalili (Kennedy, 2002), the earthbag building system, in keeping with the principles of sustainability, allows for the construction of affordable, sustainable housing through the use of locally available materials. In order to evaluate the sustainable properties of earthbag building, the U.S. Green Building Council’s (USGBC) Leadership in Energy and Environmental Design (LEED) Home was used. This program provides a voluntary standard for the development of high performance, sustainable buildings (U.S. Green Building Council, 2005). In addition, the program promotes the transformation of traditional home building practices into those that are more sustainable. Using the LEED Home in conjunction with the earthbag building system, this study identified the sustainable characteristics of the earthbag building system. The study found implications throughout the design and construction process for sustainable homes. Earth-filled bags have long been used for military and disaster relief applications, serving as bunkers and flood barriers, respectively. Architects such as Frei Otto and Gernot Minke have experimented with earthbags for architectural purposes (Kennedy, 2002). Earthbag-like structures, including homes, were completed in both the 1930s and 1940s, while Minke completed a single-story structure in 1978 using a combination of pumice and cotton hoses (Kennedy & Wojciechowska, 2005). Since 1990, innovations in earthbag home building have been pioneered by architect Nadar Khalili of the California Institute of Earth Art and Architecture (Kennedy, 2002). These advancements in the earthbag building system allow for the construction of affordable, sustainable housing through the use of locally available materials and inexpensive construction, maintenance, and use. However, the earthbag system is not widely known and its sustainable characteristics, therefore, have gone unrecognized throughout the home building industry. The earthbag construction technique can be defined as construction that uses locally available soil in combination with woven bags, which are filled and stacked to form a building. The procedure is as follows: burlap or polypropylene bags are filled using pre-moistened, locally available site soil and are laid in a running bond (Kennedy, 2002). Next, each row is compacted using “hand tampers.” Compacting prevents the fill material from settling over time. Two strands of four point barbed wire are laid between rows, serving as a “velcro mortar” (Hunter & Kiffmeyer, 2004). Finally, the structure is covered with plaster in order to protect against climatic conditions (Hart, 2003). This type of “construction enables the [use] of monolithic architecture, [allowing] an entire structure to be built from foundation and walls to roof using the same materials throughout” (Hunter & Kiffmeyer, 2004). Those materials include bags, fill, gravel, barbed wire, wood, and plasters. Bags, typically burlap or polypropylene feed sacks in 50 or 100 pound sizes, serve as forms to hold the earth providing tensile strength, serving as flood barriers and allowing for easy plastering of the home (Hunter & Kiffmeyer, 2004). The fill material optimally consists of 30% clay and 70% sand, with 10% moisture content. Sand provides bulk for earthwall compression and strength, while clay serves as the glue holding sand and gravel together to form a solid conglomerate (Hunter & Kiffmeyer, 2004). Moisture allows the mix to be pounded into a rock hard mixture (Wojciechowska, 2001). Gravel is typically used for the foundation, but it is sometimes used in the first few rows of the earthbag building, too. A trench four to six inches wider than the proposed wall is dug and filled with gravel in order to form a solid foundation (Hunter & Kiffmeyer, 2004). Barbed wire is laid between each row of earthbags, clenching the bags together and providing tensile strength (Kennedy, 2002). This innovation, developed by Nader Khalili, is unique to earthbag building, allowing for construction of the characteristic corbelled dome. If desired, branches with thorns may serve as an alternative to barbed wire (Wojciechowska, 2001). Plywood, usually ¾” thick, is used in the construction of door and window forms around which the earthbags are laid in order to form openings (Hunter & Kiffmeyer, 2004). Additional wooden supports may be required for some two-story home designs. Plasters are not required for all construction, but are highly recommended for permanent structures or those with high sun exposure (Kennedy, 2002). Plasters serve as mold, vermin, and UV protectants and include mud, clay, and sand and fiber mixes. These may be used for both interior and exterior applications (Hart, 2003). Finally, additional materials and finishes, as well as electricity and plumbing, may be incorporated into the structure as if it were a typical home construction. earthbag system as the skills needed to build a home are minimal, and homes are often built by the homeowners themselves. Adaptability and durability are further strengths of the earthbag building system, as the technique may be modified as necessary to suit any environment including areas susceptible to freezing, flooding, drought, wildfires, and seismic activity (Hunter & Kiffmeyer, 2004; Kennedy & Wojciechowska, 2005; Wojciechowska, 2001). In addition, earthbags may be used to construct not only dome-shaped homes, but also more traditional rectilinear homes. Construction time is another advantage of earthbag building as the construction takes a significantly shorter time than other natural building techniques such as adobe, and the structure may be recycled once it is no longer in use (Kennedy & Wojciechowska, 2005; Wojciechowska, 2001). sustainable home that enhances human lives. commercial buildings (U.S. Green Building Council, 2005). In doing so, the program served to establish a standard measurement of green building, promote “whole-building design,” recognize sustainable leaders in the building sector “stimulate green competition,” increase awareness of the benefits of sustainable design, and fundamentally alter the building sector (U.S. Green Building Council, 2005). Benefits of adopting the LEED system include those related to humans and to the environment. Human lives are primarily impacted through the benefits associated with higher indoor environmental quality including improved health and productivity. Similarly, the environment benefits through the maximization of natural resources, conservative energy practices, and the minimalization of environmental pollution related to these practices. However, the LEED system no longer applies to, or benefits, only newly constructed commercial buildings. The USGBC now has LEED programs related to existing commercial buildings (LEED-EB), commercial interiors (LEED-CI), core/shell projects (LEED-CS), neighborhood development (LEED-ND), and, most recently, residential home building projects (LEED-H). Council (2005), the objective of the LEED-H program is to develop “an effective tool for introducing green building practices to a significant portion of the new home building marketplace.” These practices include the sustainable use of energy, water, building construction, and land resources, as well as the enhancement of indoor environmental quality. Homes participating in the LEED-H program may attain a certified, silver, gold, or platinum rating based on performance in the following categories: home location, site sustainability, water efficiency, indoor environmental air quality, materials and resources, energy and atmosphere, homeowner awareness, and innovation and design process. Credits are awarded in each category and tallied to determine the level of LEED-H certification. water and chemical-based fertilizers. Landscaping must also shade 50% of the site’s hardscape to reduce radiant heat effects. temperature control, as well as proper ventilation, are key elements of the indoor environmental quality credit. Occupants also must be protected from kitchen and bathroom pollutants, air particulates, and other air contaminants. process credits may be attained by adopting sustainable building and interior design practices beyond those prescribed by the LEED-H program. The purpose of this study was to promote awareness of the earthbag building system, while calling attention to its sustainable properties. An interview with Kelly Hart, the homeowner/builder, and site observations of his earthbag home were conducted to collect the data. Then, to determine the sustainable characteristics of the earthbag building system, Hart’s earthbag home was evaluated using the LEED-H certification and rating system. The study was conducted in 2005. Hart’s background consists of both traditional and natural building techniques, as well as video production. He has combined these interests to form greenhomebuilding.com, an informational Web site concerning sustainability and natural building techniques. The interview with Hart consisted of 16 open-ended questions and was conducted using a semi-structured interview technique to gain insight into the philosophy of the earthbag construction technique, including its origins, sustainable characteristics, and prevalence throughout the home building industry. Construction methods and materials used in the earthbag construction technique were also of interest. Questions were developed prior to the interview; however, the order of questions was not predetermined, which allowed for improvisation by the subject and the researcher. Permission to conduct the interview was obtained from the subject, followed by Institutional Review Board approval of the interview questions. Rapport between interviewer and subject was established through email contact prior to the data collection stage. The interview was conducted in the Hart home and videotaped to reduce interviewer bias and increase reliability. The video was used to create a transcript of the interview. Upon completion of the interview, site observation of Hart’s earthbag home was conducted. The Hart home is located in Crestone, Colorado, and was constructed by Hart using the earthbag construction technique. Construction was completed over a period of three years with Hart serving as the sole designer and builder. The site was excavated to a depth equal to that of the frost line then partially filled with a layer of gravel and scoria to aid in site drainage. Polypropylene bags were filled with crushed volcanic rock to buffer the interior space from extreme hot and cold temperatures. The bags were then stacked and secured using a combination of barbed wire and bailing twine. Once the initial structure was completed, Hart used a papercrete plaster, made from paper, soil, and cement, to seal and protect the residence. Other materials used in construction included wood and found objects that serve as support beams and windows, respectively. The home is rodent, insect, and fire proof as a result of the techniques and materials used. Site observation included a neighboring earthbag home. Guided tours of both homes were videotaped, with Hart providing an in-depth analysis of the methods, materials, and philosophy used to construct his home. The video was used to create a transcript of the Hart home tour. The interviewer also took still photographs of the Hart home. These photographs captured construction details of the earthbag building technique and sustainable features of the home. The Hart interview and Hart home site observation were compared to the LEED-H certification and rating system in order to determine the sustainable properties of the earthbag building system. First, data were evaluated to determine compliance with the LEED-H certification criteria. The LEED-H certification checklist consists of eight categories: Location and Linkages, Sustainable Sites, Water Efficiency, Indoor Environmental Quality, Materials and Resources, Energy and Atmosphere, Homeowner Awareness, and Innovation and Design Process. Within these categories are a total of 42 criteria. Using these criteria, the primary researcher analyzed the transcripts obtained from the Hart interview and home tour. Additional researchers then reviewed the data to ensure a non-biased evaluation. Only when the Hart home fulfilled the recommended sustainable measure was the home determined to comply with one of the 42 sustainable criteria set forth by LEED-H. In addition, where criteria recommended sustainable measures for equipment such as HVAC and the Hart home utilized no such equipment, yet substituted a sustainable solution such as natural heating and cooling, the home was found to be in compliance. The home was found to be sustainable in these cases as the homeowner’s substitution achieved the same, if not greater, results than would have been achieved if the system were in existence and the homeowner had followed the LEED-H recommendation. After determining which LEED-H criteria were fulfilled by the Hart home, the reason for compliance was investigated. Researchers divided the fulfilled criteria into two groups: criteria that were fulfilled by the earthbag building system and those that were fulfilled by designer decisions. LEED-H criteria fulfillment was attributed to the earthbag building system if compliance was independent of designer decisions. LEED-H criteria fulfillment was not attributed to the earthbag building system if compliance was dependent on designer decisions. Sustainability of the earthbag building system was evaluated using LEED- H criteria. By category of LEED Home criteria, the earthbag home met the following: Location and Linkages – three of four requirements, Sustainable Sites – five of five requirements, Water Efficiency – zero of three requirements, Indoor Environmental Quality – six of ten requirements, Materials and Resources – six of six requirements, Energy and Atmosphere – eight of eleven requirements, Homeowner Awareness – zero of one requirement, and Innovation and Design Process – one of one requirement. 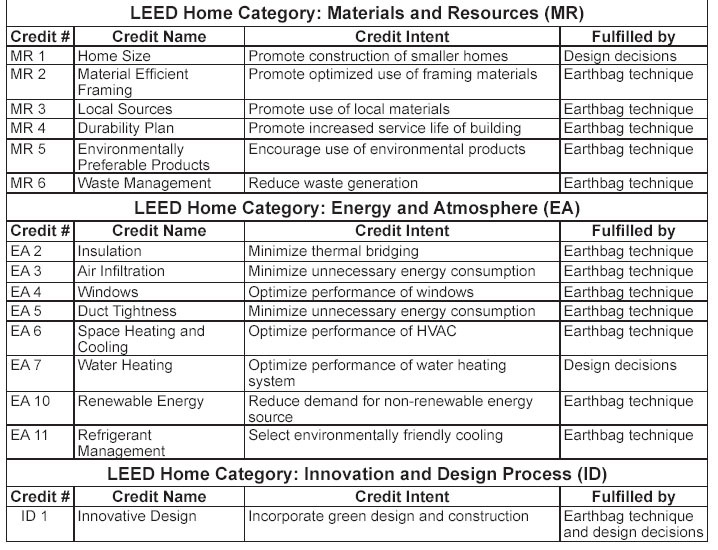 LEED-H requirements fulfilled by the Hart home are shown in Table 1.
earthbag, strawbale, and adobe. The Hart home, as well as the sustainable building community, has avoided encroachment on the nearby Great Sand Dunes National Park and Preserve (Location and Linkages 2). The Hart home is located within approximately one-half mile of green space and approximately five miles of existing community services (Location and Linkages 3). Construction of the home left the surrounding trees and foliage intact as stated in requirements Sustainable Sites 1 – Sustainable Sites 4, clearing only the area necessary for the home’s foundation. Water use and run-off control are achieved through the presence of naturally occurring foliage, as is shading of earthen sidewalks and driveway. Naturally occurring foliage also reduces the need for toxic pest control, as does the inherently pest resistant earthbag construction technique (Sustainable Sites 5). Indoor air quality is also improved through earthbag construction as humidity levels are controlled (Indoor Environmental Quality 3) by the use of natural materials. Ventilation and air distribution (Indoor Environmental Quality 4, 6) are also facilitated by natural material use, as well as by vent placement. Housing occupants are protected from contaminants and radon gas (Indoor Environmental Quality 8, 9) through the use of natural ventilation techniques and minimization of traditional heating, ventilation, and air conditioning systems (Energy and Atmosphere 3, 5, 6, 10, 11). Protection from vehicle emissions (Indoor Environmental Quality 10) is assured through the presence of a detached, rather than attached, garage. The Hart home is a one bedroom structure, making it smaller than the national average (Materials and Resources 1). Materials used throughout the home eliminate the use of traditional wood framing materials by 95% (Materials and Resources 2) and are naturally occurring, local materials (Materials and Resources 3, 5). The use of these natural materials, in conjunction with the home’s durability, greatly reduces the amount of waste generated by the home (Materials and Resources 6). Durability of the home is ensured as earthbag structures have been tested against rain, wind, and seismic activity (Materials and Resources 4). Insulation of the structure is achieved through material use (Energy and Atmosphere 2). Windows allow for solar heating of the space (Energy and Atmosphere 4) while water heating is achieved through the use of solar panels on the home’s roof (Energy and Atmosphere 7, 10). Finally, the home incorporates both green design and construction through the use of a natural construction technique, material choices, and natural heating and cooling techniques (Innovation and Design Process 1). While the Hart home met many of the requirements set forth by the LEEDH certification and rating system, not all compliances were attributable to the earthbag construction technique. Rather, some compliances were attributable to designer choices. Compliance with guidelines in the following categories may be attributed directly to the earthbag building system: Indoor Environmental Quality, Materials and Resources, Energy and Atmosphere, and Innovation and Design Process. Detailed information concerning the LEED-H requirements fulfilled by the earthbag building system is listed in Table 1. For example, credit 3 in the LEED-H category Materials and Resources states that homes should promote the use of local materials. Since the earthbag building system uses natural materials, such as soil, that are available on site, compliance with this criterion was deemed attributable to the earthbag building system. Similarly, compliance in the following categories may be attributed to decisions made by the homeowner/builder: Location and Linkages, Sustainable Sites, Water Efficiency, and Materials and Resources. 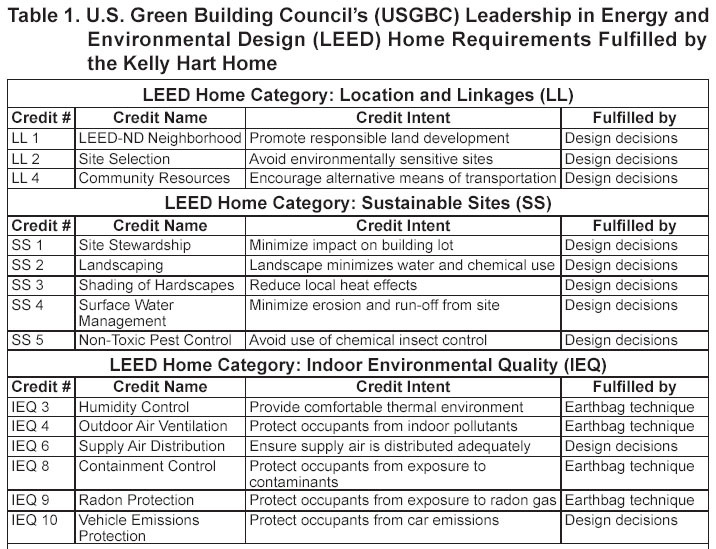 Detailed information concerning the LEED Home requirements fulfilled by designer decisions is listed in Table 1, too. For example, credit 10 in the LEED-H category Indoor Environmental Quality states that housing residents should be protected from vehicle emissions. The Hart home fulfills this requirement as the designer consciously chose to build a detached, rather than an attached, garage. This decision eliminates contamination of air within the home due to vehicle emissions. system possesses inherently sustainable properties. Specifically, these properties are directly related to the materials used by the earthbag construction technique. Locally available and naturally occurring, these materials not only address the requirement set forth by the LEED-H Materials and Resources credits, but also the LEED-H Indoor Environmental Quality credits. The earthbag construction technique also addresses the LEED-H Energy and Atmosphere credits through the insulating and energy-efficient properties inherent in the earthbag system: a significant wall thickness for thermal regulation purposes, natural ventilation methods, and a reduced amount of energy needed to heat or cool the home. Finally, the use of a natural building technique also ensures some level of sustainability. However, the inherent sustainability of the earthbag construction technique may be complimented and enhanced by choices made by members of the home building industry. Of particular concern is the selection of a neighborhood location near existing infrastructure and green space, as well as the selection of a sustainable site. Sustainability of the earthbag construction system may also be enhanced through the use of solar collectors for the purposes of heating air and water. Finally, it is the decision of the designer to use the earthbag construction technique, thus greatly increasing the sustainability of the home. Therefore, the earthbag building system’s sustainable characteristics and properties can be enhanced by the designer’s decisions. Also, members of the home building industry can use the LEED-H program to make design decisions to ensure and increase the sustainability of earthbag homes. Sustainable design practices have become increasingly important in the building industry. This study focused on one such sustainable practice, the earthbag building system, to determine its sustainable properties. Although the earthbag system was found to possess inherent sustainable properties, designer decisions regarding construction and design greatly impacted the sustainability of the Hart earthbag home. 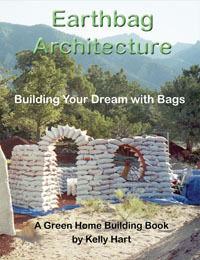 Currently, the earthbag building system is not widely applied throughout the U.S. Construction using this technique is concentrated in the states of Colorado, New Mexico, and California, and the buildings have been constructed primarily by experts who are interested in natural building techniques. As the earthbag building system possesses inherent sustainable properties, further research might be conducted to study opinions of and openness to the earthbag building system to determine its viability within the home building industry. Such a study might consider both industry and homeowner viewpoints. Also, similar studies could be conducted regarding other natural building techniques such as strawbale or adobe. Sustainable design is relativity new and growing and will be achieved through careful and thoughtful consideration of design decisions. Guidelines or tools that assist in decision making for sustainable design would encourage practice of the design. LEED-H is one such tool that could be used by the home building industry to enhance the sustainability of homes. This does not mean that sustainable design is accomplished by following a checklist of guidelines, nor can it be achieved by single strategies. However, the use of LEED could be the departure for sustainable design practice and basic methods. Further development and implementation of the LEEDH program throughout the home building industry could result in an increase in the sustainability of newly built homes. As the LEED-H program is still in its pilot stage, additional studies could be conducted to refine the LEED-H certification criteria. Additional studies of design methods and processes for sustainable home development are necessary. Illustrating the benefits of natural building techniques such as the earthbag building is important, as is the awareness of tools that may be used to increase sustainability. By studying the sustainable properties of the earthbag building system in conjunction with the LEED-H program, this study has increased awareness. Brooke Barnes is a Graduate Student, Mihyun Kang is Assistant Professor, and Huantian Cao is Assistant Professor, Department of Design, Housing, and Merchandising, Oklahoma State University, Stillwater, OK. Partial support from the U.S. Environmental Protection Agency under a STAR Research Assistance Agreement No. SU832506 (P3 Award: A National Student Design Competition for Sustainability) is gratefully acknowledged. Guy, S. (1998). Developing alternatives: Energy, offices and the environment. International Journal of Urban and Regional Research, 22, 264-282. Hunter, K., & Kiffmeyer, D. (2004). Earthbag building. Gabriola Island, Canada: New Society Publishers. Kennedy, J. (2002). Building with earthbags. In J. Kennedy, M. Smith, & C. Wanek (Eds. ), The art of natural building (pp. 149-153). Gabriola Island, Canada: New Society Publishers. Kennedy, J., & Wojciechowska, P. (2005). Modular contained earth. In L. Elizabeth & C. Adams (Eds. ), Alternative construction: Contemporary natural building methods (pp. 175-194). Indianapolis, IN: Wiley. Kibert, C. (2005). Sustainable construction. Hoboken, NJ: John Wiley & Sons. Kwong, B. (2004). Quantifying the benefits of sustainable buildings. AACE International Transactions, RI101-RI106. Wajciechowska, P. (2001). Building with earth: A guide to flexible-form earthbag construction. White River Junction, VT: Chelsea Green Publishing. World Commission on Environment and Development. (1987). The Brundtland report: Our common future. Oxford, United Kingdom: Oxford University Press.